Starbucks manager, Tara Koskinen had to cover up her tattoos at work before October 2014, when Starbucks changed their dress code policy. An orange shaded octopus is draped across her shoulder, an anatomical heart rests on the left side of her back and a cursive quote streams down her forearm. They are three of 10 tattoos that cover her body. With four of her tattoos visible when she wears a t-shirt, Tara Koskinen is one of many artistic people who have had to cover up their artwork, at one time or another. In order to get the job, she grudgingly accepted her employer’s policy. “I accepted their [Starbucks’] dress code; however every day I had to cover up a part of myself,” said Koskinen, a manager at Starbucks. But employers may be stuck in an old perception of tattoos. What started out as a symbol of the working class, or gang related pride, by 2000 became popular across a culture of musicians and actors, eventually making its way into reality television shows like Ink Master and Miami Ink. Most recently, the hipster fad has brought on its own style of tattoo that involves geometric shapes, quotes, anchors and best of all, a rise in sleeves. When deciding on the image and placement, not to mention a trustworthy artist to do the permanent work, not many keep in mind future employment. “In the past, tattoos were strictly considered a mark of criminals or other ‘undesirables,’” said George Novoselac, a tattoo artist and police constable. As a constable tactical officer for the Emergency Response Unit in Hamilton, Novoselac considers himself an artist who classifies tattooing as a different medium in art. And although societal views of tattoos have shifted from criminal connotations to expressions of art, when it comes to the business world, a conservative mindset will often prevail. As internships, placements and graduation approach, students need to remember the importance of first impressions and the effects tattoos may have on their careers. “When you go into an interview, you don’t want it [tattoos] to become the focus,” said Wally Stadnicki, client services manager at Employment Hamilton. Covering up tattoos won’t necessarily get you the job, but it will eliminate any prejudgment or prejudice that the employer may have. Before 2014, Starbucks’ dress code included a no visible tattoos policy. Although the world-wide company had been discussing a new dress code for some time, the ban on tattoos was lifted after 25,650 Starbucks employees signed an online petition in early 2014. Some found the Starbucks ban on tattoos surprising given its environment and the culture of baristas who are often tattooed. It is a reminder that any company could have a dress code policy that stands against visible tattoos. As an arts campus, it’s no surprise that many Sheridan students have at least one, if not multiple tattoos. “I find with our artistic students and clients, they do tend to be more heavily tattooed and depending, they are usually going into an arts base environment,” said Jane Douglas, coordinator at Oakville’s Community Employment Services. 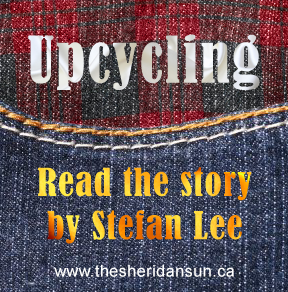 Many Sheridan graduates enter art careers that allow different forms of expression, but some positions may still require a cover up. “I always make a point to make sure people know that most types of employment do not allow visible tattoos,” said Sam Tyson, tattoo artist at Good Point tattoos. With the growth in popularity of tattoos over the years—36 per cent of America’s 18 to 25-year-olds have tattoos, with 40 per cent being between the ages of 25 to 40, according to Pew Research Center—visibility of such tattoos is still an issue. 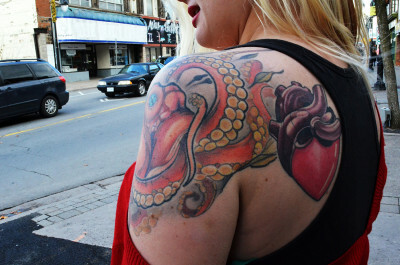 A Workopolis poll found that 77 per cent of employers might be or will be less likely to hire someone based on tattoos. The survey consisted of 327 employers, and only 23 per cent said tattoos would have no effect. As an artist in the field, Tyson believes there is still and will always be a stigma around tattoos. Added by brittanypreocanin on November 25, 2015.